My grandfather, William Ross was born in Maybole on Wellington Street in 1905. He emigrated to Hamilton, Ontario Canada in the 1920's and eventually settled in Windsor. 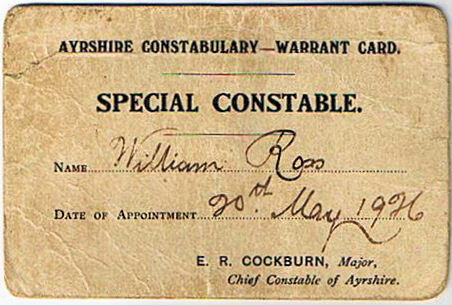 At one time he was a Special Constable in Ayrshire (I believe due to a strike). 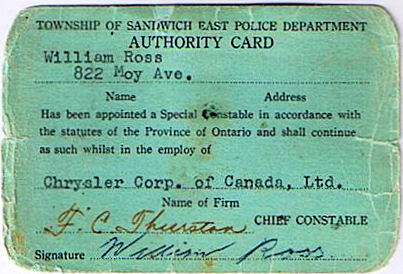 After he settled in Windsor, he worked for the Ford Motor Company and later Chrysler - in plant protection. As such, he was a Special Constable here as well and I am lucky enough to have both of his warrant cards. Before coming to Canada, he was presented with an inscribed bible, and inside for all of these years is a sprig of heather pressed between the pages. The photo (right) from the 80's, includes my grandmother, Isabel Ross (m.s. Bulloch). She is from Hamilton, Lanarkshire. They met here in Windsor and married in Michigan. Bible presented to William Ross in 1928 before leaving Ayrshire with sprig of heather pressed between the pages. I also found William Ross in the photo of the Annual Hamilton Picnic shown on the Maybole website! (Click on the photo at left to view full size.) The photo (at right) is at the old New York Central Railway station here in Windsor in the 1950's, right by the rail tunnel to Detroit. The man on the left is Harry Williamson, who lived in Maybole before coming over to Canada, in the centre is my grandfather, William Ross, and on the right is my uncle, Robert Ross. More about William Ross on my website.